Complex timekeeping, scheduling and cost accounting made easy. Complex Union rules and accruals, without custom programming. Police, Fire, Corrections, Healthcare - complex scheduling that works. Easy to use and feature rich time clocks. Scheduling and timekeeping data to drive better planning. Tools for today’s government on the move. Automate leave, scheduling, transfers and alerts. Make your services easy to find and connect them to the people that need them. Modern customer service organizations have moved beyond the noise of Social Media. With the IntelliTime Citizen Services module, we connect your citizens to their government and the staff that deliver those services in an unparalleled Service Delivery Architecture. 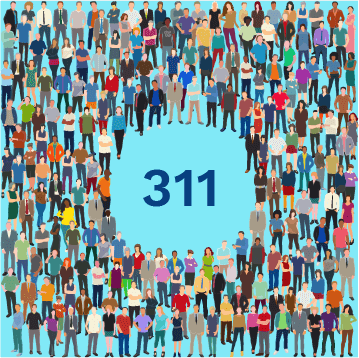 Citizens can use multiple 311 channels to request the service they need, using the technology most familiar to them. Telephone calls, online applications, clickable maps, smartphone apps and more are supported. Its does not limit many of your citizens who have limited technology options, where "high tech" is too high to reach. The foundation of the architecture is your IntelliTime Workforce Automation solution that connects every public employee to the work they perform day in and day out to run your government. Managers can use IntelliTime to schedule, plan and assign work and track the labor, equipment and materials used to complete the task. It all ties to your ERP system and delivers one solution to connect everything to everybody. Future focused governments are moving beyond social media to connect citizens to their government. Click on a map to report what and where needs attention. Put applications online in minutes. One simple number to access every service. One place to look for everything you do. Provides flexible Workforce Automation solutions designed for dynamic public sector organizations who have to wear a lot of hats to serve their citizens. IntelliTime has a product that is a perfect fit for each employee – no matter what hat you wear. Watch the Video to Learn More!